Piano teachers at Music House run the gamut of music education and experience. 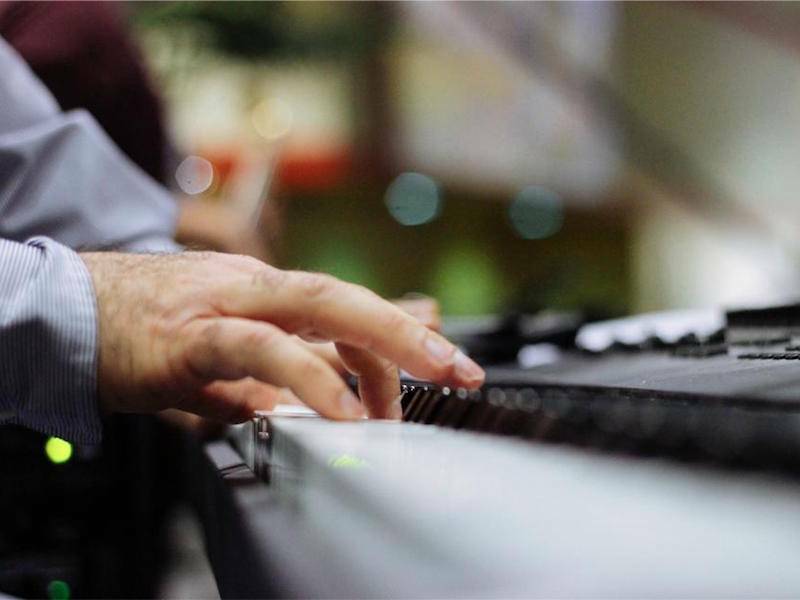 These teachers not only teach students to play piano, they have experience as professional pianists, sharing the stage with national and international artists. They are composers, worship pianists, accompanists, and educators. They have bachelors and masters degrees in piano performance, jazz performance, technology, and piano pedagogy. They are enthusiastic teachers who love to get their students excited about learning to play, and help them through the challenging moments along the way. What does that mean for you? It means that Music House is a place where you can start your child, or even yourself, on an adventure in learning that will give you many options along the way. Here's a little more information to help you get to know these piano teachers better. What is your favorite thing to teach? What makes you happy to see them learn? Charles: Since as far back as I can remember, my parents have taught me to be creative and solve problems on my own. As a teacher, I am most rewarded when I help my students apply their knowledge in imaginative ways, so that they may discover their own real answers to musical challenges. Instead of teaching my students the easy answers, I encourage them to become great problem solvers. I feel that a musician’s ability to combine creativity and intelligence to overcome obstacles is truly the most enduring resource because it comes from within one’s self. Daphne: It makes me happy when you see students have light bulb moments, and they discover that their hard work practicing has allowed them to improve and be successful. I enjoy seeing my students play songs they are excited to play. One student I have memorized the song from "The Pink Panther" for a student showcase, and he'll sit down and play it during his lessons. Jason: I love teaching my students to play music they enjoy because they are more likely to enjoy learning that way. Andrew: It's very important to me that the students enjoy and get something out of music lessons, and one of the best ways to do that is to let them play and perform the music they are listening to outside of music lessons. As a teacher, I am most rewarded when I help my students apply their knowledge in imaginative ways, so that they may discover their own real answers to musical challenges. What have you done with your music education and experience? Andrew: My most interesting experience was going to Japan with the UMKC jazz band in 2010. We played Bobby Watson's Gates BBQ Suite, as well as a few other selections. I also had time to see a bit of Japan while I was there. Charles: In my experience, music has allowed me to collaborate with many other people, and this has always been one of the most interesting and inspiring features of music for me. I never considered myself a social person until long after I entered the music world. Looking back now, some of my best friends are the people I worked with as an accompanist or chamber musician, and music provided the opportunities for us to meet each other, to share our ideas, and to spend time together. Daphne: Some of the things I've enjoyed most is singing in the Kansas City Symphony Chorus and accompanying students at district contests. Jason: I worked at a music camp and enjoyed working with all the students, helping them to practice and become better musicians. Daphne: Keep playing, don't quit! We all run into things that are harder to learn and take more effort, but if we power through and keep at it we will see that we have grown more and become better at playing because of it. And that's a great feeling! Jason: Don't take yourself so seriously. It's ok to make mistakes. That's how we learn. Charles: Watch other musicians perform. The internet may be a great resource for hearing music, but nothing will inspire you like attending a live performance where you can watch the performers up close and feel their music through your body. There are so many opportunities for this, whether you watch a showcase event at Music House, a performance by the choir or band at your school or church, or attend a live performance in downtown KC. In my experience, I’ve actually learned as much or more from observing people who sing or play other instruments than from watching my teachers and colleagues who play piano. Also, push yourself to listen to music that is out of your comfort zone! I strongly believe that having an open mind for new things motivates you to learn more and helps you to expand your interests. Andrew: My advice to students would be to listen to music as much as you practice it. Musical learning goes far beyond the practice room. The greatest musicians I know are people that listen to new music every day, read books and articles on a variety of topics, talk and collaborate with other people on a regular basis, and perform frequently. What is the best way for students to become better pianists? Charles: I believe the best musicians are those people who have a genuine curiosity for learning more and trying new things. Musical learning goes far beyond the practice room. The greatest musicians I know are people that listen to new music every day, read books and articles on a variety of topics, talk and collaborate with other people on a regular basis, and perform frequently. This all goes beyond dedicated practice on your instrument. My advice for students is that you always feed your curiosity, and let that be something which motivates you to work harder and go beyond the expectations of your teacher. Andrew: The best way for students to become better musicians is to practice with a metronome. In music, timing is everything. Daphne: Practicing and performing on a consistent basis will help you become a better musician. Another way to improve dramatically is learning to play songs that are challenging or outside your comfort zone. Jason: Play music with others. Keep at it. Enjoy all of the small successes along the way. Be patient and good things will come. Learning to play the piano is a rewarding and challenging pursuit. Finding a teacher that will motivate you and keep you excited to learn new things will make the process incredibly smoother and deliver winning results. Want to learn more about the musical journey? Maybe you're not sure where to even start? Click the ebook image below to download our 20+ page ebook full of helpful tips.